Darwin's Angel. 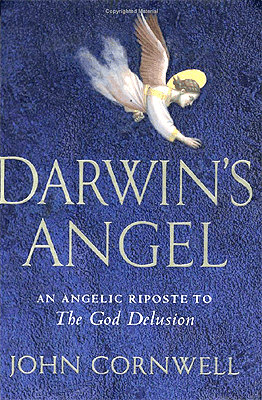 An Angelic riposte to The God Delusion, John Cornwell, Profile Books, 2007, ISBN 978 1 84668 048 9, website. It is difficult to respond at book length to polemical works. Particularly to works that are as swingeing and expansive in their argument as Richard Dawkins' The God Delusion. Your response must draw energy from what it criticises, and the time and energy devoted to the task inevitably makes your opponent seem important. Successful refutations show a deep understanding of their targets. They bring out the force of the opposed argument and display its hidden connections. Although mudslinging and snide imputations may be difficult to resist, particularly when used by one's opponent, they are ultimately suicidal weapons. It is important to offer a more attractive and genial understanding of the issues addressed. By these high standards, Darwin's Angel is an engaging but flawed work. Its title is an elegant conceit. By imagining that the reply comes from the guardian angel of Charles Darwin and Richard Dawkins, Cornwell dramatises his assertion that the human world cannot be defined exclusively by material and biological processes. He is also able to take a rhetorically large view of the issues that Dawkins raises, distinguishing his work from mere polemic. His execution of the task, however, is thoroughly human in its virtues and limitations. He relies on a close reading of The God Delusion that credits Dawkins with meaning what he says. He concedes the strong points of Dawkins' argument, and goes beyond assertion to argue the many detailed points of criticism that he makes. These include Dawkins' reliance on flawed authorities, his implicit appeal to intolerance and his erection and demolition of straw men as ciphers of religious faith. But his angelic narrator also dips his wings in the mud, occasionally adopting an Olympian disdain and using ad hominem arguments. More seriously the detail included in a short book — 21 sections in 150 pages — obscures the shape and roots of Dawkins' argument. Neither does Cornwell's own argument shine lucidly. Although he shows that Dawkins' book has many weaknesses, his own position does not commend itself strongly. Ultimately Dawkins and Cornwell differ about the nature of reality and so about what must be included in a truthful account of it. Dawkins' view confines reality to the material elements and to the evolutionary processes that have shaped its complexity. We can only know reality through scientific observation and inference. Consequently the only valid questions concern how our world came to be. Dawkins discourages us from asking why the world was made, what destiny awaits it, or why some human qualities seem to transcend biological processes. The strength of Dawkins' position lies in its old-fashioned respect for truth. He is angered by what he sees as falsehood, and believes that a world based on false religious belief will be vicious. Like his Christian opponents who believe that the falsehood of secularist belief will inevitably corrupt society, he does not argue from empirical evidence to his conclusion. Instead, his convictions lead him to see empirical evidence that supports them. They also underlie his desire to eradicate religious belief. Dawkins' work invites the reader to ask whether this understanding of reality and of truth does justice to our experience of reality. Cornwell deals episodically in arguing for the possibility of a theist construction of the world. He argues that it is legitimate and natural to ask why anything should exist rather than nothing. Although he does not develop the point, it is surely here that the crucial difference between the two writers lies. Cornwell puts in analytical terms the question why anything should exist rather than nothing. But underlying the question is the passionate human experience of engagement with and wonder at the richness, variety and liveliness of existence. For Dawkins this excitement can lead properly only to analytical questions about what we can see and infer about the visible world. The task of those who oppose this view is to describe the richness and mystery of existence in such sinuous and accurate terms that Dawkins' exclusion of larger questions will appear to be an invitation to live in an impoverished world. I believe all people of faith, particularly Christians, should read Dawkins' book and then try and answer the question 'what is Dawkins missing?' Dawkins in my view (like so many Christians in the world) mistakenly defines Christianity in terms of the 'religiosity' that has been built around the faith (mainly to suit ourselves) rather than the life of Jesus of Nazareth 'who came that we might have life abundant'. The 'troubled artist', creative but self-destructive, looms large in pop culture. The film Control offers sympathy for the artist's love ones, who are left bruised and bleeding.